Sterilization - the destruction of various microorganisms and them dispute by means of physical and chemical factors. To the physical factors of sterilization include high temperature, ultraviolet rays, ionizing radiation, ultrasound and filtering through bacterial filters. In laboratory practice sterilization using high temperature is achieved by burning on the flame, heat dry heat of boiling, processing steam or fluid the ferry under pressure. Fig. 1. Bunsen Burner. Fig. 2. Burner To Teklu. Fig. 3. 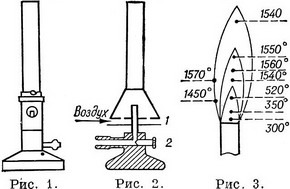 Distribution of temperature in the burner flame. Fig. 5. Water baths: 1 - with a constant flow of water; 2 - cylinder; 3 - round bottom. Fig. 6. Cucereavoi sterilizer. Sterilization on flame is a simple and reliable method for handling different heat-resistant include needles, bacterial loops, microbiological spatulas, pipettes, subject and integumentary glass, tweezers, etc., For this purpose use of gas burners system Bunsen (Fig. 1) or Teklu (Fig. 2). Bunsen burner is equipped with mobile clip, moving you to regulate the access of air. In the burner to Teklu the number of the incoming air is adjusted by moving the drive (Fig. 2,1), the number of gas - screw (Fig. 2, 2). If no or insufficient access of air formed Koptseva flame. The access of air to the burner to regulate the receipt of blue fire. The approximate distribution of temperature in the burner flame is presented in Fig. 3. 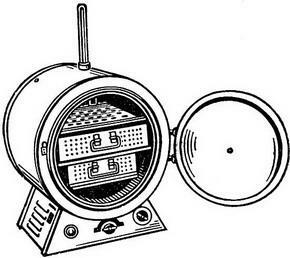 Sterilization by dry heat is produced in an oven (oven Pasteur). This method is sterilized only dry items, glassware, dressings , etc., Drying Cabinet (Fig. 4) is a small iron box, with double wall, between which invested insulation material (asbestos, glass wool). Clean tubes and bottles sealed with a cotton plugs; pipettes, cotton wool, gauze wrapped in paper and placed on a rack so that sterilized objects do not touch the hot walls of the device and heated air to pass freely between them. Sterilization and drying Cabinet lasts 45 minutes - 1 hour at temperature 160-170°, At temperatures above 175 degrees paper and wadding burn. Boiling water destroys Nesporova forms of microbes for 1-3 minutes Syringes, needles, knives, small tools, etc., can be boiled in metal sterilizers and even in the pan. Addition to water small amount of sodium bicarbonate (bicarbonate of soda) increases the effectiveness of sterilization. 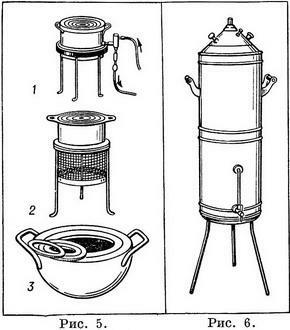 Bottles, tubes or vials of liquid can be sterilized by boiling water bath (Fig. 5). Once boiling destroys dispute germs, so if you need applies fractional sterilisation, i.e. the boiling of 30-40 minutes during three consecutive days.